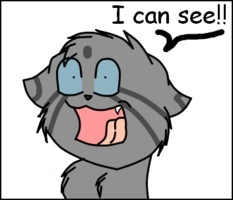 Jayfeather is happy. He's happy. Wallpaper and background images in the Warriors (Novel Series) club tagged: warriors jayfeather. I can see that, lol. Lol I love it never ever saw him happy before.